high density « Global Market Insights, Inc. Driven by rising product application in various end-user industries like agriculture, construction and mining & quarrying, ammonium nitrate market has registered substantial growth in recent years. A chemical component that is widely used for producing high-efficiency, nitrogen fertilizer for top-dressing winter crops and for sugar cane cultivation, ammonium nitrate indirectly helps enhance the growth, quality & safety of crops and further improve production yield. Reliable reports suggest that the global population is likely to surpass a mammoth 8 billion by 2030, which will in turn increase the demand of ammonium nitrate-based fertilizers in the years to come, given the subsequent surge in the demand for food. Since plant roots are incapable of directly absorbing nitrogen(N) from urea-based fertilizers on a large extent, many farmers nowadays prefer a quick absorbing nitrate source for plant nutrition and opt for ammonium nitrate as their N fertilizer. It is widely used for pasture and broadacre crops due to almost zero ammonia volatilization loss offering, compared to urea-based fertilizers. According to reports, around 37 MMt (million metric tons) of fertilizer grade ammonium nitrate is annually consumed in agriculture worldwide, of which about 14 MMt is used as calcium ammonium nitrate (CAN). Due to its high crop recovery, easy application and suitability for in-season top dressing, ammonium nitrate has witnessed widespread application in agriculture, particularly in several European countries. Ammonium nitrate is also a vital ingredient for making mining explosives worldwide. The mining industry mostly relies on low-density ammonium nitrate (LDAN) that is used as a high-quality, cost-efficient mining explosive & blasting agent, particularly with ANFO (Ammonium Nitrate/ Fuel Oil) or in emulsion-type explosives. On account of the product’s fast oil absorbing property, excellent sensitivity to shock waves and flexibility, LDAN market is anticipated to grow at a CAGR of 4% over 2018-2025. Apart from the agricultural industry, the mining & quarrying sector is a vital end-use domain for the ammonium nitrate market. Indeed, several mining, quarrying & construction industries use ammonium nitrate as an essential part for their blasting operations. Ammonium nitrate in its prill form is the primary ingredient in ANFO-based products and the key component in a full range of customized bulk explosive blends. Aided by the expansive number of drilling operations in the global oil and gas exploration sector, ammonium nitrate market share from mining & quarrying applications will register a CAGR of 1.7% over 2018-2025. Speaking of the regional terrain, it is pivotal to mention that the Asia Pacific will stand as a pivotal revenue ground for the ammonium nitrate market. The growth can be aptly attributed to the fact that China is rapidly emerging as one of the largest mining countries in the world, particularly for rare-earth commodities. Increasing exploration activities in the oil & gas sector and rising mining and quarrying activities in the countries like India & China will boost the demand for ammonium nitrate for manufacturing explosives in the coming years. 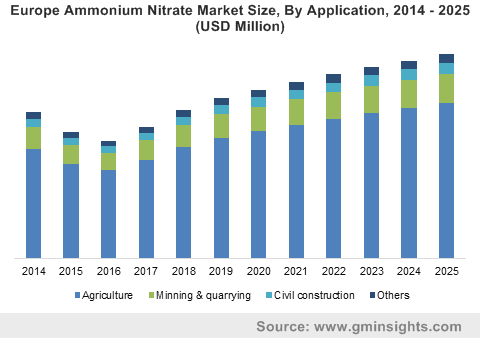 Furthermore, rapid growth in the agriculture sector owing to increasing development in agro-based countries will propel the APAC ammonium nitrate market share. Another regional contributor, India, has also been making massive strides in terms of sales and revenue. According to the IBEF 2018 report, during the 2017-18 crop year, India’s food grain production was estimated to record 284.83 million tons, while, in 2018-19, the Government of India anticipates garnering enhanced food grain production, which would help augment the market growth. As per estimates, APAC ammonium nitrate market size is set to register a CAGR of 3.1% over 2018-2025. Resembling a crystalline chemical compound, ammonium nitrate is highly water soluble and stable at lower temperatures, however, decomposes explosively at the temperatures above 200°C (390°F). The chemical is widely used in agriculture fertilizers and mining explosives. The growing demand for fertilizers, increasing food demand and rising mining activities around the world will drive the growth of the ammonium nitrate market. Furthermore, reports from Global Market Insights, Inc., cite that the global ammonium nitrate market will exceed $23 billion by 2025. This entry was posted in Bulk & Specialty Chemicals and tagged Agriculture, Ammonium Nitrate Manufacturers, Ammonium Nitrate Market, Ammonium Nitrate Market Outlook, Ammonium Nitrate Market Report, Ammonium Nitrate Market Size, Civil Construction, high density, Low Density, Mining & Quarrying, Solution. 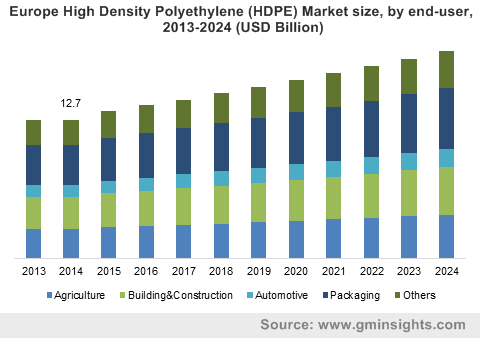 The rapid development of the electronics, construction, and packaging sectors will lead to an upward curve in Global High Density Polyethylene Market. Growing inclination of pharmaceutical companies and hospitals toward using high density polyethylene for medicine bottles and other forms of medicinal packaging will lead increased product demand. In addition, this polymer is used extensively across the F&B sector to pack edible foodstuff, owing to its improved mechanical properties and temperature toughness. The urban trend of preferring packaged (ready-to-mix and ready-to-eat) meals will provide ample growth prospects for high density polyethylene industry to progress in the food & beverage sector. Leading manufacturers strive to produce a wide range of product grades to meet the growing demand. Efforts are being undertaken to specially design HDPE grades for customized applications such as telecom ducts, bags, sacks, and high pressure pipes. Notable companies involved in the manufacture of various grades in HDPE market include (Borouge) Abu Dhabi Polymers Company Ltd., PetroChina Company Limited., The Dow Chemical Company, Borealis AG, Braskem S.A., Honam Petrochemical Corporation, Formosa Plastics Corp., Chevron Phillips Chemical Co., and Exxon Mobil Corp.
Film & sheet form possesses properties such as flexibility, rigidity, clarity, affordability, and chemical inertness. Film & sheet contributed to more than 20% of the overall high density polyethylene industry share in 2015, and is projected to grow at a rate of 4.5% over 2016-2024. Blow molded form of HDPE is endowed with favorable properties such as stiffness resistance, impact strength, cracking resistance, and temperature tolerance. It is principally used to manufacture water tanks, dustbins, fuel tanks, ducts, and plastic bottles. Blow molded form accounted for more than 25% of the total high density polyethylene market in 2015, and will grow significantly over the coming years. In the process of injection molding, plastic is first melted and then injected into a mold under high pressure. This form of HDPE is used to produce electronic components such as cell phones and contributed to more than 15% of the overall market share. HDPE is a key raw material of injection molded plastic market due to its high resistance properties. Europe high density polyethylene industry covered more than 20% of the global revenue in 2015 and will record a CAGR of 3% over 2016-2024, driven by the huge expansion of the infrastructural sector in countries such as Spain Germany, and Italy. Rapid growth in the cosmetic and construction sectors and the huge demand from packaged F&B market will drive APAC HDPE industry, which accounted for more than 40% of the global share in 2015. The escalating infrastructural developments and rising construction spending in China and India will also fuel APAC HDPE market. High density polyethylene market from packaging applications was worth more than USD 16 billion in 2015. With prominent utilization in the cosmetics, pharmaceutical, and F&B sectors, this application segment is set to accrue substantial profits over 2016-2024, especially across Latin America and the U.S.
High density polyethylene industry is slated to observe remarkable gains from numerous sectors, given the widespread scope of these products. For instance, HDPE pipes are highly affordable in terms of material and installation, owing to which they are used for water supply and irrigation in agriculture. HDPE is also used to produce electrical boxes and telephone ducts. The rapid expansion of the construction, transportation, automotive, and packaging sectors will stimulate the industry trends in the years to come. This entry was posted in Polymers and Advanced Materials and tagged HDPE, HDPE market, high density, high density polyethylene, high density polyethylene market, high density polyethylene market Analysis, high density polyethylene market growth, high density polyethylene market outlook, high density polyethylene market PDF, high density polyethylene market report, high density polyethylene market share, high density polyethylene market size, high density polyethylene market trends, low density polyethylene, polyethylene.